Cedar Hill MO real estate is made up of both established and newly constructed homes. These single family homes offer floor plans with 2 bedroom, 3 bedroom or 4 bedroom options. Homes for sale in Cedar Hill range in price from approximately $25,000 for mobile homes to approximately $400,000. The median home price in 2014 was approximately $139,000. If you are unfamiliar with Missouri landscapes Cedar Hill reflects the state landscape perfectly with it’s rolling hills, speckled lakes and rivers, and tall woods that are just simply breath-taking when the fall leaves change their colors. Low crime rates and well-rated school districts, Cedar Hill, is the perfect quiet neighborhood community to raise a family. And don’t forget to go enjoy sitting on the outside patio with some of the friendly locals after grabbing a delicious slice of pizza at Sorellis Italian Restaurant located at the Cedar Hill Plaza. The school district for Cedar Hill provides exceptional education including Northwest High School. If you’re interested in learning more about selling a home in Cedar Hill MO or buying a home in Cedar Hill MO, please contact St Louis County real estate expert, Sharon Colona and St. Louis Realty for a professional and simple buying or selling process. Call (636) 397-7653 or email at scolona@stlouisrealty.net. Awesome home that is in immaculate shape and sits on 5 pristine, mostly cleared and usable acres. This home has 4 bedrooms and 3.5 baths, with a finished lower level and walk-out. Awesome oversized, carpeted garage, cool sunroom, 2 covered decks that walk-out from bedrooms and approx. 3000 sq. ft of finished living area. within walking distance to Don Robinson State Park. The main level features a breakfast room/kitchen combo with breakfast bar, Corian counters,& updated cabinets. Also on the main level is a living room, family room with FP, and enclosed sunroom. Upstairs is a master bed/bath suite,3 add. bedrooms and two walk-out covered decks. The LL is finished with a nice sized Family Room, full bath and walk-out to a concrete patio. Other features of this home are newer roof, gutters, and fascia wrap, septic system replaced within the last 10 years and beautiful landscaping that compliments this majestic lot with some outstanding views. Full brick home, pool, & Home Warranty too. The Hickory 2 offers 4 bedrooms, 2 1/2 baths with 2 car garage. Features include architectural shingles, microwave, smooth top stove, water line for ice maker, garage door opener, six panel doors, vinyl windows and much more. Many plans to pick from, colors and upgrades available. Price does not include a lot. The Hickory 1 offers 3 bedrooms, 21/2 baths with 2 car garage. Features include architectural shingles, microwave, smooth top stove, water line for ice maker, garage door opener, six panel doors, vinyl windows and much more. Many plans to pick from, colors and upgrades available. Price does not include a lot. The Cottonwood offers 4 bedrooms, 2.5 baths with 2 car garage on 4 acres. Features include architectural shingles, microwave, smooth top stove, water line for ice maker, garage door opener, six panel doors, vinyl windows and much more. Many plans to pick from, colors and upgrades available. Price does not include a lot. The Millstone offers 4 bedrooms, 2.5 bath with 2 car garage. Features include architectural shingles, microwave, smooth top stove, water line for ice maker, garage door opener, six panel doors, vinyl windows and much more. Many plans to pick from, colors and upgrades available. Price does not include a lot. NEW PRICE! This is a great Opportunity to purchase a MOBILE HOME PARK with Outstanding Investment Potential! This Mobile Home Park sits on 7+ acres with plenty of green space and a manufactured home (used as office plus living quarters), 46 pads with 2 mobile homes owned by seller. Each pad rents for $230 with the owned mobile pads renting for more. Call for details. The Dogwood offer 3 bedrooms, 2 bath with 2 car garage on 4 acres. Features include architectural shingles, microwave, smooth top stove, water line for ice maker, garage door opener, six panel doors, vinyl windows and much more. Many plans to pick from, colors and upgrades available. Price does not include a lot. A little slice of privacy and paradise awaits. Beautiful rustic ranch situated on just over 5 acres of ground w/ professional landscaping. Semi open floor plan with 3 beds and 2 baths on main level. Good sized kitchen with updated appliances, ceramic tile, tons of counter space and cabinets. 10x8 main floor laundry just off kitchen. Master Bedroom suite features bonus room bath with jacuzzi tub, separate shower and double bowl sink, walk-in closet & skylight. Vaulted living room w/ woodburning fireplace & skylight, walks out to covered upper level deck complete with ceiling fan & lighting allowing you to enjoy a beautiful parklike setting. Lower Level is finished with large open rec room including wet bar, xBD; bath & extra sleeping room. Walk out to lower level covered deck and boardwalk to side deck. Zoned heating and cooling. Also oversized 2 car attached garage with workshop. New Roof June 2013!Much Much More! Fully renovated, ranch house on 1 acre with a park-like setting. Beautiful home on cul de sac ready for new owners. Peaceful neighborhood on quiet street, with large patio and mature trees. Lots of room for entertaining with large yard, extra parking and multiple spaces for your guests. Large, eat in kitchen with tons of cabinets and counter tops. Beautiful separate dining room with bay window. Flooring has been updated throughout the home to include lots of custom ceramic tile and hardwood flooring. Modern, updated bathrooms with newer fixtures. Shiplap wall in living room. Fresh paint in most rooms. The basement was finished in 2014 with over 1000 square foot added just in the finished areas. Basement includes finished living area, wet bar, sleeping area/office, custom walk in closet, hobby/safe room, and an unfinished storage area. Too many updates to list. This house is a must see! YOUR OWN PRIVATE COUNTRY RETREAT WITH AN AMAZING LOG HOME! Located in sought-after Sunny Acres Estate Subdivision. Beautiful 3+ acres of gentle sloping land with yard that backs to woods and a serene creek in back of property. Horses are welcomed! Well-constructed custom built log home with 10 logs; open concept living area with gorgeous stone wood burning fireplace and circulating blowers to generate lots of heat; deck off family room allows you to enjoy the views and wild life of this fantastic property; basement includes large egress windows and sliding glass door that allows for much light, as well as rough-ins for an additional bathroom and fireplace......a great area to add your own finishing touches and create additional living space; large 2 car garage; utility shed; access to subdivision lake with great fishing; and Don Robinson State Park approximately 1 mile away! Neighboring lot of 3+ acres is also for sale if interested in expanding your property to 6+ acres! Looking for a great spacious ranch home on acre of ground, here it is. No subdivision restrictions. Property fenced very level and has a building behind the main house that be perfect in-laws or guest quarters or a awesome home office space with a bathroom and kitchenette. Also be a great gardening shed , work shop or more. The master bedroom was extend to have additional space. The kitchen and bathrooms could use some updating, but perfect time at this price you can design the way you like. xD; xA;You can move in now and due work a little at a time. The dining room has sliding doors going out to a beautiful screen in porch giving the view of the private back yard and relaxing fish pond ( goldfish included) The garage was converted in a extra large family room with hardwood flooring and lots of windows . There is a full basement ready for you to finish any time. Home warranty included. Hurry now! NO MONEY DOWN USDA LOAN AVAIBLE , Check your qualifications with you lender. Nestled on a cul-da-sac this. Charming 3 bedroom 2 bathroom home is waiting to welcome it's new family. The home offers an open floor plan. The seller has done a lot of updates for you recently. Items such as a newer HVAC system, roof and recently updated kitchen just to name a few. The master bedroom and living room have beautiful arch windows to allow a lot of beautiful sunshine for your home. These rooms also have vaulted. Ceilings to open up the rooms. The kitchen has newer appliances, a stainless steel refrigerator, a double oven, dishwasher, and built in microwave. The walkout basement is finished as well with a large rec room with a pool table and a lot of space for entertaining. Don't miss this home in the Hillsboro school district. 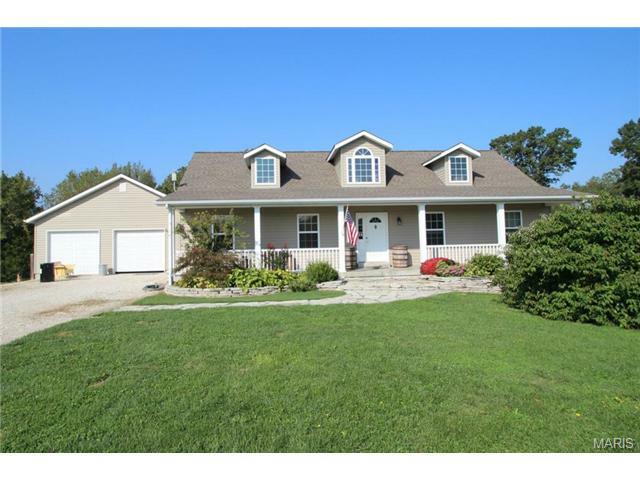 Looking for quiet country life , this home is on almost 2 level acres partly wooded . Updated just 6 years ago xD; xA;and has been beautifully maintain since. Spacious kitchen with breakfast bar, ceramic flooring plenty of cabinets and counter space. French doors going out to deck for those relaxing evenings or early morning coffee , with plenty of shade trees . Vaulted ceilings and large foyer entry gives you a very open spacious feeling. Main floor laundry is a plus. Downstairs family room a great place for other family member's needing their own space. The garage is truly oversize with a work shop area. Extra gravel pad perfect for a camper , RV or just additional parking . Storage shed give you additional space. Home warranty. Watching deer in your yard can be your new favorite past time to relaxing. No money down for USDA loans. Call for your private showing today. There was a fireplace in the living room up stairs, sellers closed it up, but chimney still there. Bring your ideas & make this fixer-upper your dream home with a huge yard for a garden, crops, or just space to entertain. This is 2+ acres situated between 2 newer subdivisions. Possibility to tear down & build new homes. Sale includes 2 parcels with separate tax ID#'s 06-6.0-24.0-2-001-013(home) & #06-6.0-24.0-2-001-011(vacant lot). This home is a diamond in the rough. Great bones & very spacious. Main floor master, wood burning fireplace, newer roof, furnace & water heater. Hardwood floors under all main level carpet(preview hardwood floors in front of fireplace). Huge covered front porch extends across the entire front of the home. Small covered back porch. Utility shed & small barn, in addition to 1 car detached garage & 2 car carport. Seller was told that the home was previously moved due to highway expansion in the mid 70 x2019;s, however, he has no documentation regarding this, as it was before his ownership. Home is being sold As-Is. Seller to perform no repairs or inspections. Check it out mostly renovated 3+ bedroom home. Brand new kitchen cabinets installed with gorgeous granite counter tops and lots of cabinets.Brand new stainless steel appliances, Stove,micro wave, dishwasher and refrigerator, all set to start cooking in your new xD; xA;kitchen. New laminate flooring in some rooms. Freshly painted. Bathroom upstairs just updated new vanity ,mirror and lighting . Bedrooms very spacious. Huge fenced back yard, great for the family and pets. xD; xA;Small deck off living room with a partial view of Lake Adelle depending on the season. Downstairs has a full bath and sleeping room still needing finishing touches, but a good jump start to designing your own way. Walk out to patio and back yard. Price to sell .Cheaper than renting!! USDA area , No money down with approved credit . Plenty of parking space. UPDATES THROUGHOUT!!! This home is a MUST SEE!! Welcome to this completely renovated and move-in ready home. Renovations have been made inside and out. You are greeted with a large inviting landscaped yard perfect for bonfires and entertaining. There are 2 ponds, a 10x10 shed with work bench, and a covered storage area. When you walk in to the home you will be wowed by the beautiful hand placed mosaic kitchen floor. Vaulted 10 ft. Ceilings and pergo wood floors throughout add a gorgeous and warm feeling to the rest of the home space. The home has been meticulously maintained and it shows in the details from room to room. It is conveniently and privately located near major roads and rivers. Home is being sold AS-IS. Seller to do no repairs or inspections. Home warranty included. Don't let that deter you from checking out this quaint and modern home. Truly an adorable Bungalow located across the road from Big River! It would make an ideal rental. Cute, Peaceful and 2 level lots! Notice the original wood floors - beautiful! Compact but lots of outdoor living space! New Roof in November 2018. Seller says home has never flooded during her ownership - obvious, from the condition of the wood floors. Recorded Shared Well Agreement with 7371 Riffle for $15/month.